Pan Grilled Chicken Panini for days when you long for warmer temperatures in anticipation of sun kissed moments while lounging in your own backyard in short shorts, tank tops and flip flops! The ground was wet from the nights unusual rainfall considering the still colder temperatures, while the clouds were thick and grey signalling more rain to come. With its prominent blue feathers and distinctive crest peaked with excitement, he wandered in the garden with his head bobbing around while scavenging over the partially frozen ground. He was a sight to behold and a sharp contrast to what was definitely shaping up to be another dull and long gloomy Spring day! I scrambled around in search of my camera wanting to capture its elegant beauty on film but alas when I returned to the rain paned window, the Blue Jay had already flown away…hopefully he found his ray of sunshine as it seems to have escaped us these last few days! 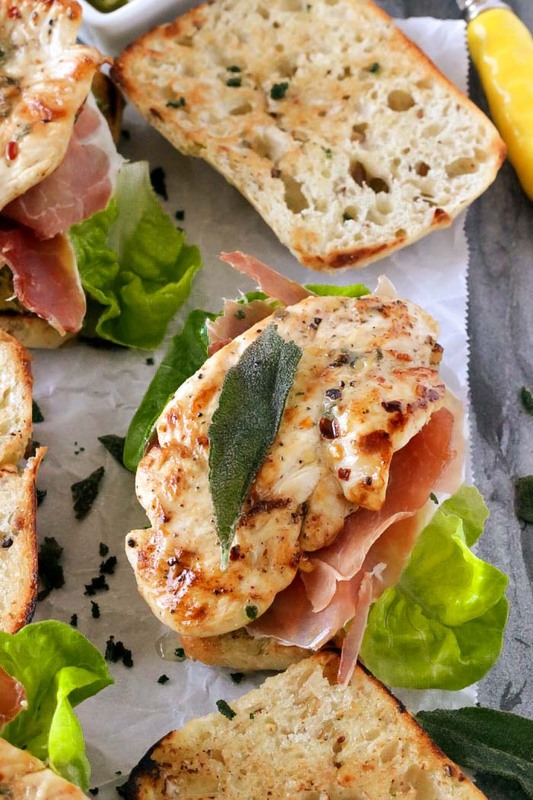 Pan Grilled Chicken Panini with a slathering of artichoke pesto and thinly sliced servings of prosciutto and lettuce make an irresistible lunch or dinner. How perfect these panini are to pack for outdoor picnics but also equally fun for indoor picnics as well. They’re definitely my ray of sunshine on windy rainy days! Cutting a chicken breast in half and pounding them to a 1/4 inch thick and then allowing them to soak in a quick brine is my preferred way of preparing this tasty meat. It’s a technique I learned from Fine Cooking Magazine and one that’s easily adapted to suit your own taste buds with your choice of fresh herbs and seasonings. With this method, cooking time is reduced to 1 or 2 minutes per side and therefore yields a moist meat without drying it out. The chicken slices also cook evenly since the thickness is pretty much consistent. I fried some sage leaves and tucked them into the panini for some extra goodness. But don’t throw out the oil because there’s lots of yummy flavor there. Instead, use it to brush over the sliced buns and then either pan grill the bread or toast in the oven. Overall these Pan Grilled Chicken Panini made a delicious usage for my leftover artichoke pesto! However you can just as easily go for store bought if you wish. And now I’m wishing for some warmer temperatures to enjoy these panini outdoors! Pan Grilled Chicken Panini with a slathering of artichoke pesto and thinly sliced servings of prosciutto and lettuce make an irresistible lunch or dinner. A perfect panini to pack for outdoor picnics but also equally fun for indoor picnics as well. Slice each chicken breast into 2 pieces widthwise across the grain. Use a meat pounder to pound each piece of chicken to about a 1/4 each thick. 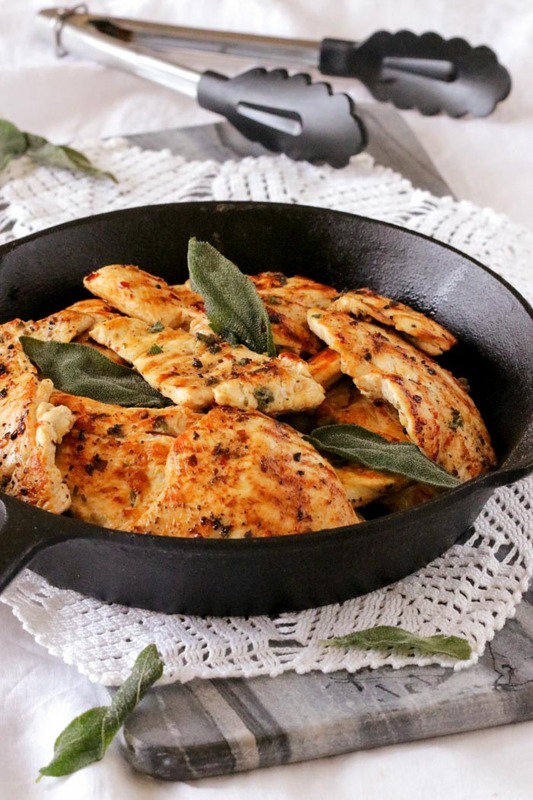 Transfer the chicken breasts on a baking sheet placing them in a single layer. Season each slice of chicken with salt, pepper and chili flakes on both sides. Mix together the minced garlic and chopped sage then rub this over both sides of the chicken breasts. Drizzle the lemon juice and the oil on both sides of the chicken breasts while rubbing the meat to coat all over. Cover and refrigerate the chicken for 20 minutes. Meanwhile, in a small frying pan heat about 1/4 cup of vegetable oil till hot and fry the sage leaves for about 5 seconds on each side. Take care not to brown them otherwise they will be bitter. Transfer the fried sage leaves to a tray lined with paper towels till ready to use. Reserve the oil to brush over the sliced buns and toast in the oven @ 350 degrees F for about 5 minutes. While the breads are toasting, remove the chicken from the fridge. Grease a ridged grill pan with oil and heat until hot. Transfer the cooked chicken to a serving platter and repeat with the remaining slices. Drizzle the grilled chicken with a little bit of extra virgin olive oil and start assembling the Panini. Spread the panini halves with the artichoke pesto and top with a layer of lettuce, prosciutto and grilled chicken. Place the top panini bun on and enjoy! What fun! I love paninis. And these look exceptionally good! 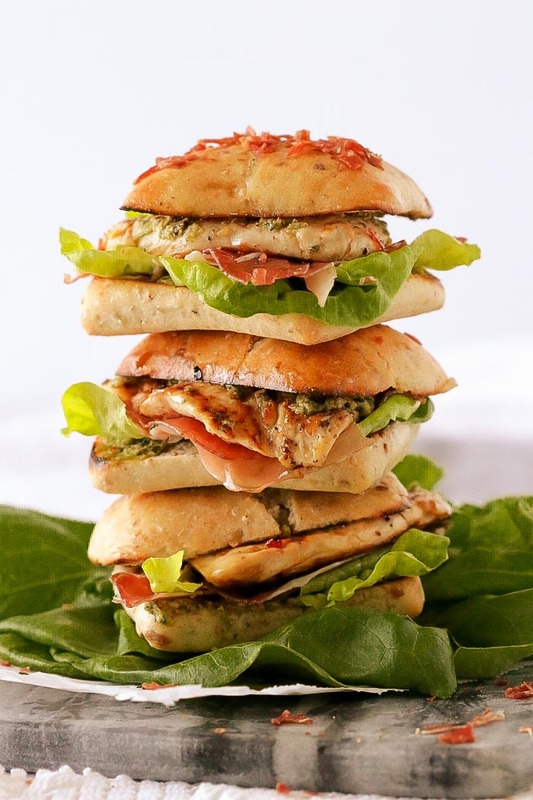 Thanks Mimi…they are indeed fun, packed with flavour and a real crowd pleasing panini! Oh my goodness, Marisa, this sandwich sounds divine. I love, love, the fried sage leaves in there and will be trying that as soon as I get my sage explosion in the garden.Thanks for sharing. I admit they’re a little fragile after frying but if you love them as I do they’re a definite must try! Thanks Colleen! This Pan Grilled Chicken panini sounds delicious, Marisa! I love the idea of pounding the chicken breasts to 1/4 inch thickness. I do the same and it saves cooking time and looks so much better for presentation. Great recipe! One would think that a cut of meat so thin would dry out but quite the opposite! A minute or 2 of grilling time is all that’s needed for these tender and flavourful slices. It’s my favourite way of grilling chicken…thanks Denise! They look spectacular. Loved the shot of the perfectly stacked paninis. I admit they were somewhat of a challenge to stack but they cooperated enough! Thanks Vidya! Great way of preparing the chicken. That stack looks amazing. Thanks Stefan…it’s my favourite summertime way of preparing chicken! That stack was devoured in no time at all? This is an epic panini sandwich! There is so much about it that I love – the artichoke pesto, the fried sage, the prosciutto. It looks so delicious! Definitely not your ordinary chicken panini sandwich! 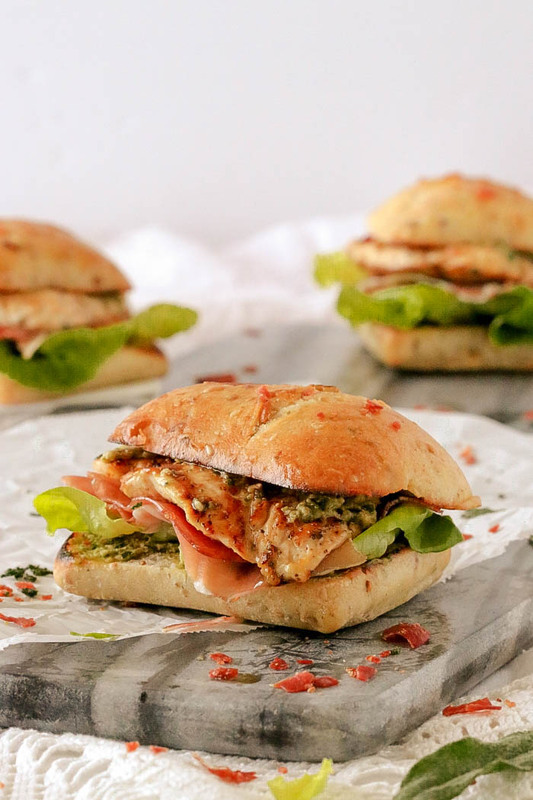 I was so glad to have used up the remaining artichoke pesto in this Chicken Panini, it really added lots of flavours and we devoured them so quickle? thanks Leanne! I was looking for an easy dinner and we love panini’s! Your fried sage leaves and using the oil will really up the yumminess too! You’ll find it really is quite easy to make for both weeknights and weekends! They’ll disappear very quickly Julie!? How absolutely tempting this is – the recipe is divine but your photos have me drooling. Terrific step by step instructions Maria, thank you for this panini from heaven. 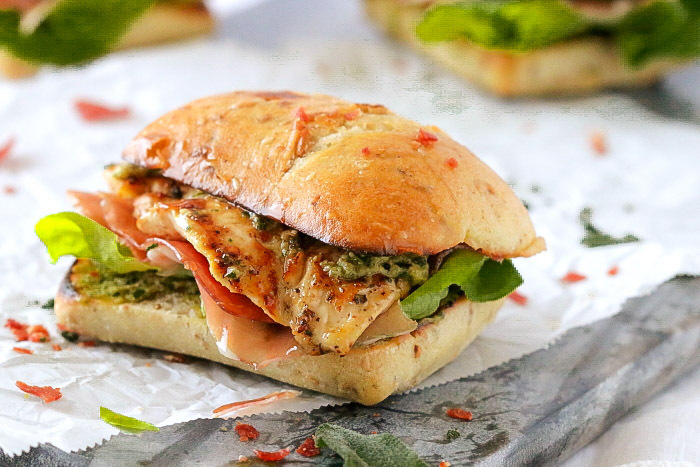 They actually bring smiles of pure bliss to everyone’s faces after the first bite and I so prefer these grilled chicken panini over hamburgers anytime! Thanks so much Paula! What a terrific way of using some of your delicious pesto. While it has been warm here, we have gotten lots of rain so I know how much you enjoyed the brilliant blue of a bluejay in your yard. Hope you are enjoying warmth and sunshine now. I happy to say that’s it’s gotten much warmer now…definitely picnic worthy weather?